This is the second album from US black metallers Uhtcearu. Hot on the heels of last year’s impressive debut album The Plight of Wanderers, Uhtcearu clearly aren’t interested in resting on their laurels as we already have a new album from them. Not that I’m complaining, as their debut album was one of the more notable and enjoyable releases of 2016. Uhtcearu ply their trade, (mainly), in melodic black metal circles. When played well, melodic black metal can be one of the more satisfying sub-genres. As long as there’s still enough bite to the band’s attack and the melodies used are not too over the top or extravagant, then it’s definitely something I look forward to hearing. Sadly, however, there are many bands that get too carried away with the melodic side and allow this to dilute the blackened core of their sound, resulting in something that may be superficially enjoyable, but lacks real substance. This is my take on the style at any rate; it’s a hard balance to achieve between blackened intent and melodic worth, but it’s one that Uhtcearu achieved quite effortlessly on their debut album. Needless to say, (as otherwise I wouldn’t even be writing this review), they have continued to get this balance right on For Darkness to Subside. Having said that, however, the Uhtcearu of 2017 is a slightly different beast to the Uhtcearu of 2016. I’d say that this time around there’s a a slightly increased amount of old-school death metal influence in some of the riffs, recalling a black metal-influenced Death. 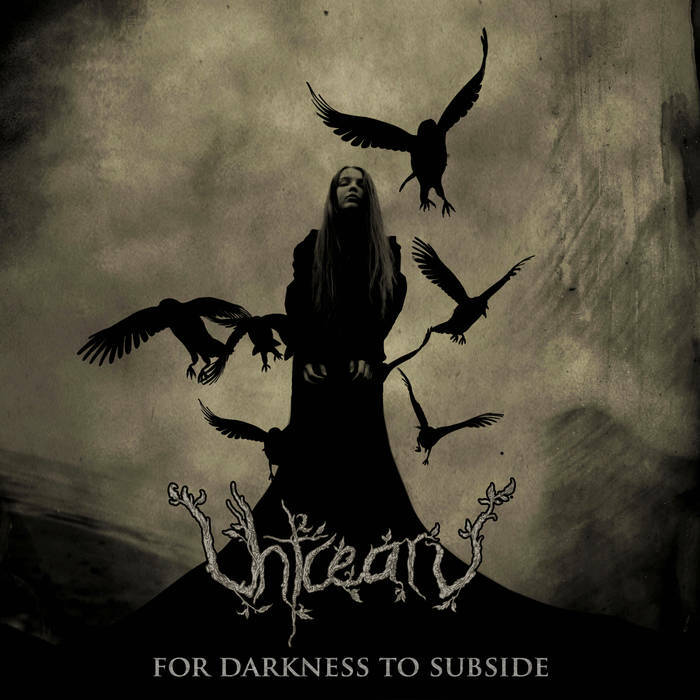 This, alongside an increased technical component in their work, has seen Uhtcearu move slightly away from melodic black metal and into more of a black/death metal hybrid territory – although it should be noted that this certainly isn’t a wholesale shift in sound, more of a progression from their earlier work. It’s not as if these elements weren’t present on their debut album, of course, but they’re certainly more noticeable on this release. So yes, there’s a decent amount of technicality on display, and Uhtcearu continue to offer up some very enjoyable solos too, which is always great to hear. I also really like the bass guitar’s contribution on this record, especially on The Depth of Gloom. The blackened melodics are still very much present and correct, although, as mentioned, these have been tempered slightly by the increased death metal influences. As befits the minor change in sound, the production is both a little rawer and warmer than that of their debut, although the frozen blackened winds can still be felt. Uhtcearu have produced yet another really enjoyable and satisfying album. Largely, but not completely, continuing where they left off from their debut, For Darkness to Subside is a tweaked and refined version of the band’s sound, one which should hopefully pay off for them. This entry was posted in Black metal and tagged Black metal, Black/Death metal, Death, Melodic Black Metal, Metal, Technical death metal, Uhtcearu. Bookmark the permalink.